In many cases, the responsibility for tree safety resides with the various owners of the land rather than the National Trail charity/trust. The landowners have the legal ‘duty of care’ to take ‘reasonable steps‘ to ensure that the trees on their land are in a safe condition – read more. You may wish to simply monitor the trees along the trails/footpaths and report issues to the appropriate owners. Or you may need to take responsibility for regular tree inspections for some parts of the trail/footpath network. 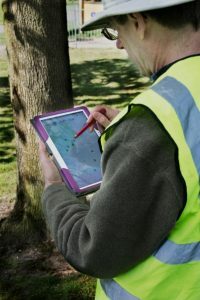 Planning and carrying out regular Tree Safey inspections and work programmes form the core of tree management systems. OTISS supports all stages of the Tree Management process. For risk management purposes, it is considered best practice to group trees into risk zones; where each zones is assigned a risk category (e.g. high, medium or low). For high risk zones, an annual inspection cycle is recommended. The inspection cycle for the for lower risk zones typically ranges between 2 and 5 years. Many landowners get an independent Arboricultural Consultant to carry out a complete survey every few years – typically every 3 or 5 years. The consultant will inspect each tree, will make a series of recommendations of work to be carried out and will assign a priority or time scale to each one. An effective rolling programme of inspection cycles and maintenance work should result in a healthier tree stock and more predictable budgets. The land managers (and consultants) will then create a multi-year work programme. This plan will be driven by the consultant’s recommendations, but will also be influenced by a range of other factors including; budget constraints, development plans for the property; the opinions/concerns of neighbours, etc. These plans are essential when managing external contractors and also your own staffs time. Between these inspection cycles, the trees may suffer from storm damage, collisions, fallen branches, disease. Your staff (rangers, wardens, etc.) may require further maintenance work or inspections to be carried out on individual trees – calling upon Arboricultural Consultants or contractors as required. The Path Survey Android™ application makes it very convenient for staff and volunteers to use their mobile phone to create new inspection records and work items – especially when they are on-site and notice something that needs attending to. An OTISS ‘survey’ is created to plan and carry out an inspection cycle on a selected section of the trail/network. If outside consultants are being used, then they can be assigned to have online access to the required maps and inspection history. This ‘survey‘ record contains general information about aims, restrictions, weather on the day, overall findings, etc. Within a survey, an ‘inspection‘ record is stored for each tree; see the full listing of tree survey data stored by OTISS for each tree. Inspections are carried out using your mobile phone or tablet (only Android at present). 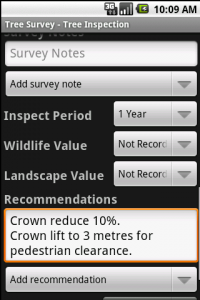 With the Path Survey Android application, you can view, update and create new tree inspections. The maps and data are synchronised between OTISS and your phone/tablet. All new tree inspections are linked to the current active survey for that site/risk-zone. When this survey is set to the ‘closed’ state. then these records are effectively frozen. Over the years, the survey records provide an audit trail that will help fulfil your legal ‘duty-of-care’ obligations. A new survey is then created for the next inspection cycle, or as a basis for any ad-hoc inspections/work. OTISS provides a set of pre-defined PDF reports and Excel spreadsheets to provide summary charts and detailed information about the surveyed trees. The Summary reports are ideal for management committees, boards of directors and governors. The detailed reports are better for day-to-day management. 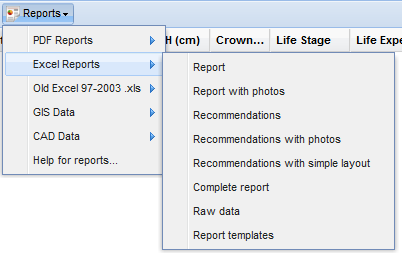 Here are some of the pre-defined PDF reports as examples of what you could achieve. 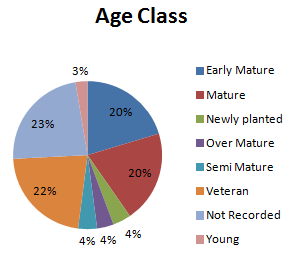 Tree Survey Summary Report provides a summary of the survey results – with charts and tables. Tree Survey Detailed Report provides a detailed set of tree inspections carried out. Survey Recommendations provides a detailed listing of the trees that require action. The audit trail, photos and history of each tree can be viewed. This provides a complete audit trail of all the inspections (including dates, surveyor’s name, etc.) and all management work carried out on the tree. TreeSafety History Report provides a detailed listing of a tree’s inspections. 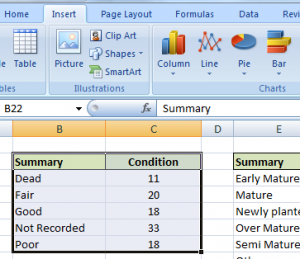 Or you can customise your own history reports with our Excel Report Templates. Part of each survey will be recommendations for maintenance or safety work. Sometimes they will recommend that a more detailed inspection be carried out by an Arboricultural Consultant using specialist equipment. All these recommendations appear on the Recommendation Reports. These are invaluable for planning work programmes and getting competitive quotes. A Recommendations Report provides a detailed listing of the trees that require action.